Railton Freeman was born in Newbury on 6th October, 1903. His father was Commander Fletcher Freeman of the Royal Navy. Educated at St Helens College, Southsea he entered Sandhurst Military Academy in 1922. Freeman was commissioned into the king's Own Royal Regiment as a second lieutenant in August 1924. Two years later he was posted to the RAF flying school near Chester. The following year he was transferred to the Royal Air Force as a flying officer. In 1931 Freeman retired from military service and bought an estate in Gloucestershire where he became a farmer. He developed extreme right wing political views and in 1937 he joined the British Union of Fascists. On the outbreak of the Second World War Freeman he was recalled by the RAF and became a flying instructor with No. 24 Squadron. On 22nd May, 1940, Freeman was ordered to fly with his squadron from Croydon to Merville. Soon after arriving in Merville his aircraft crash-landed and he was captured by German soldiers. Freeman was taken to Stalag IIa in Neu-Brandenburg. His fascist views soon became known to the Nazis and he was transferred to Frankfurt. Later he was recruited by the German Radio Corporation and took part in the 'German Calling' programme. The main presenter of this propaganda was William Joyce (Lord Haw-Haw). 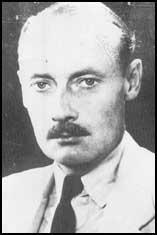 Freeman shared an office with another British traitor, Norman Baillie-Stewart. In October 1944 Freeman joined the Waffen-SS. His main role was to vet propaganda material being prepared for the British armed forces. Freeman was captured by allied troops on 9th May, 1945. Freeman was found guilty of treason and was sent to prison for ten years. He told his lawyer: "This just shows how rotten this democratic country is. The Germans would have had the honesty to shoot me." I have been bitterly opposed to the appalling menace of Soviet Communism for a long time. I have studied Moscow propaganda . . . and its hideous exploitation by World Jewry and I am more than dismayed by the fearful fate that awaits this country and western Europe, and eventually the whole world, when this menace overpowers them. I came to these conclusions long before I ever heard of Mosley or Hitler, therefore it is inaccurate to describe my views or actions as Nazi... National Socialism merely provided the one apparently solid barrier in the path of this Asiatic doctrine from which opposition could be made.